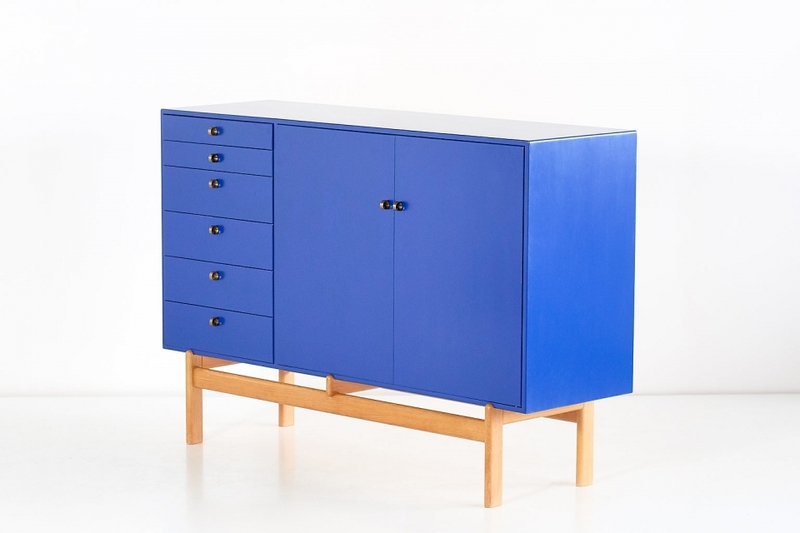 This rare blue cabinet was designed by Tove and Edvard Kindt Larsen and produced by the Swedish manufacturer Säffle Möbelfabrik in the early 1960s. 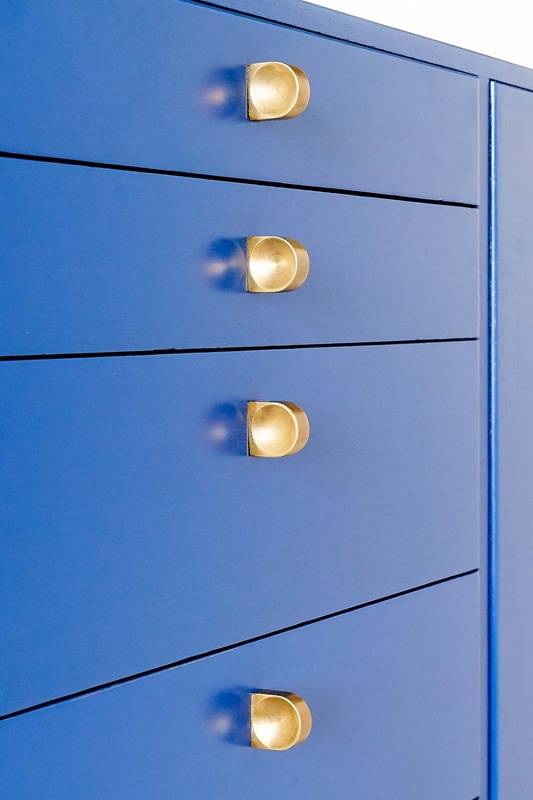 The blue parts has been finished in a particularly sophisticated manner, subtly maintaining and showing the grain of the oak wood. The color is the original blue lacquer which has been preserved very well. The brass handles and fittings and the natural oak frame offer a refined contrast. The green lacquered interior has adjustable shelves. 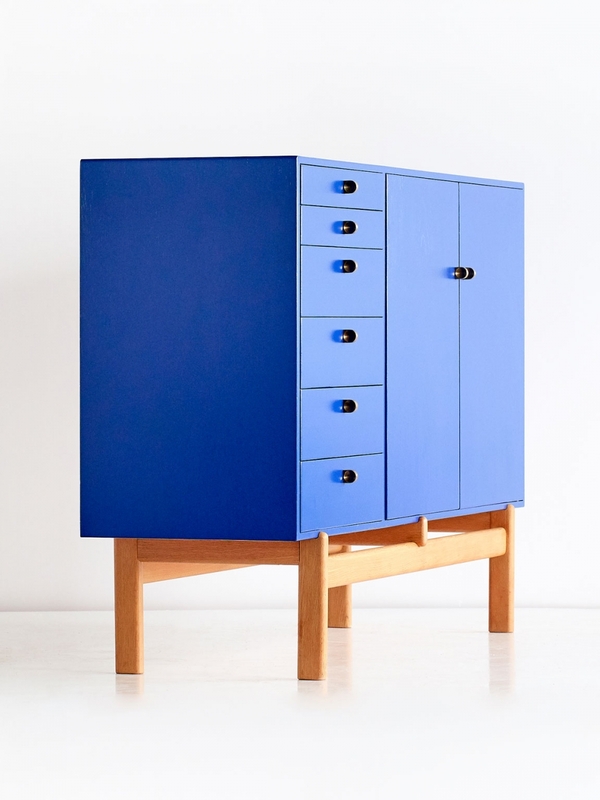 The well-conceived dimensions and the combination of drawers and shelves make this cabinet a playful yet elegant design suitable for different rooms and functions. The piece is in excellent condition and has been stamped twice by the maker, once inside the top drawer and once on the backside. 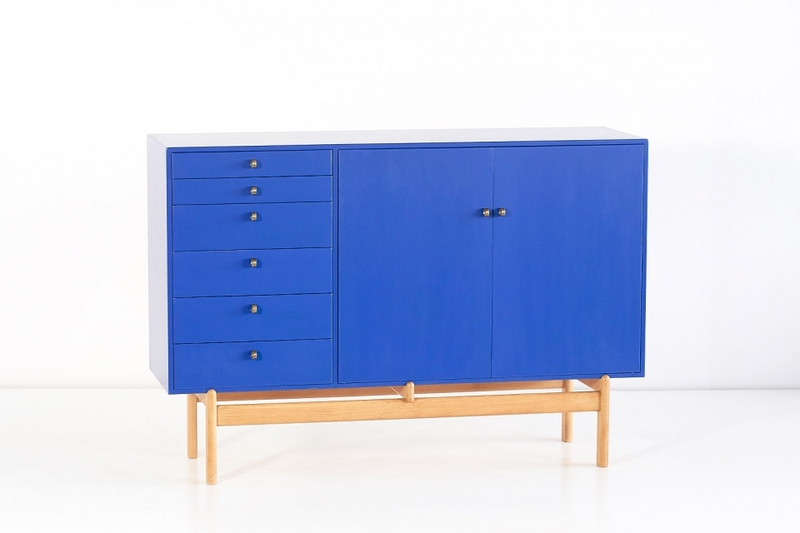 Edvard Kindt-Larsen (1901–1982) was a Danish architect and furniture designer who worked closely together with his wife Tove Kindt-Larsen (1906–1994). Both Edvard and Tove studied under Kaare Klint at the Royal Danish Academy of Fine Arts in the late 1920s. Working as a team, they exhibited a high sense of quality and appreciation of current trends. They were fascinated by the idea of contrasts, as can be seen in their furniture where they often combined different materials. From the 1930s to the 1960s, the couple were among the predominant figures in Danish design, active in the areas of architecture, furniture design, silverware and textiles.